Picketts Lock was called Piggott’s Lock until 1856, except for the years between 1826 and 1840, when it was Skinner's Lock, Picketts Lock and, confusingly, Ponders End Lock. On 12.1.1780 it was “Resolved that the following Locks be repaired with all convenient speed Viz…. 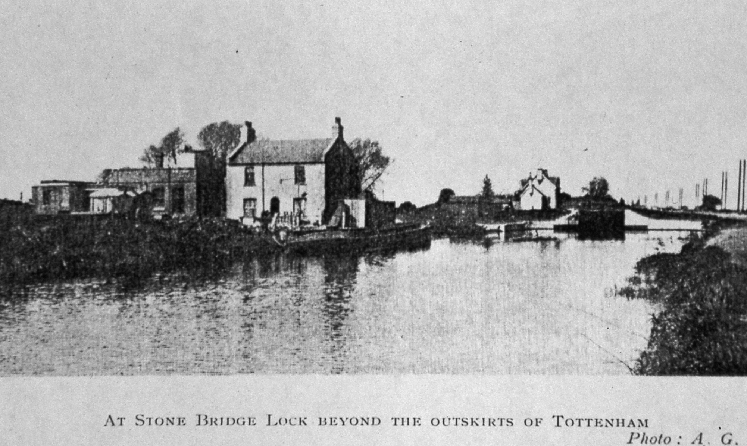 Enfield Half Lock, Piggotts Lock, Cooks Lock, Boltons Lock, Stonebridge Lock, Tottenham Lock, Lee Bridge Half Lock, Hackney Marsh Brick Cistern Lock And It Is Ordered that the Surveyor do repair the same as he shall find them absolutely necessary” (NA Rail 845/5). On 11.4.1783, the Surveyor was ordered to make new Gates and Slackers and repair the Brickwork of Piggotts Lock (NA Rail 845/6). New upper and lower gates were authorised on 19.4.1794 (NA Rail 845/7). Skinner’s Lock is an anomaly which only appeared in the Survey in 1826 and 1827. In 1826, Piggotts is not listed, so it could have been an alternative name for this lock using the lock keeper's name. Just to be difficult, however, in 1827 both Picketts (first use of this name) and Skinners are listed as separate locks! 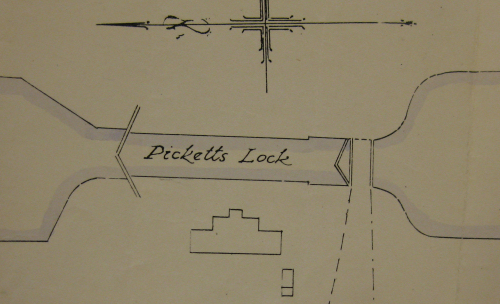 From 1827 until 1833 the name was Picketts Lock, then it changed to Ponders End Lock until 1840. It then reverted to Piggotts Lock until 1856 before finally regaining Picketts Lock. The permanent change to its present name in 1857 came a few years before the chamber was rebuilt. Portland stone was used in the invert of the new lock which had been bought from the demolition of old Westminster Bridge. The old bridge was renewed between 1854 and 1862. 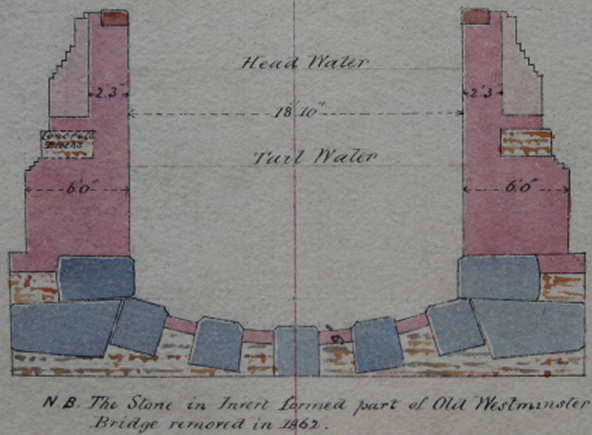 The drawings below show where the bridge stone was used. Since there is no record of a rebuild, it is highly probable that the stone is still there. 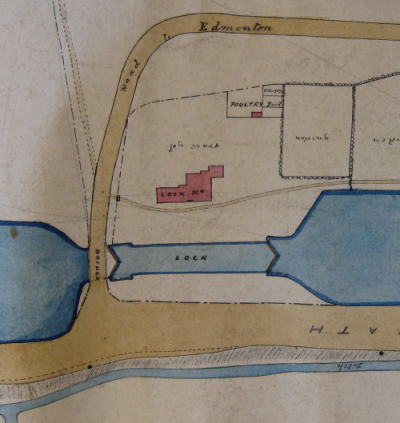 The plan to the left dates from September 1867 and shows the new lock chamber and the house which was soon to be demolished. During the Survey on 10.7.1878, the “foundations for the new lock house were in”, on 4.10.1878 "Lockhouse nearly completed - workmanship good -" and on 9.7.1879 the new Lock house was inspected. (NA Rail 845/21 and 56). On 20.4.1883, the “2 cottages” were insured for £200 (NA Rail 845/23). The old cottages were inspected in the 1897 survey and it was recommended that "they be pulled down" (LMA ACC 2423/006). 15.4.1898 "The old cottages are being pulled down" (LMA ACC 2423/006). Although the card on the left is titled as Stone Bridge Lock, it is certainly Picketts Lock. 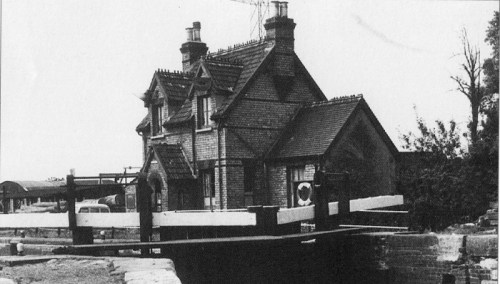 The line of telegraph poles is on the wrong side and the house is in the wrong position and of the wrong design for it to be Stonebridge Lock. This plan from 1930 shows the location of the Conservancy lock house. which was replaced by the modern bungalow pictured below. The lock was not duplicated, even though it was scheduled; trade fell away in the early 1960’s and the project was cancelled. The lock today, showing the present lock house and the chamber, seemingly basically the same as that built in 1861. 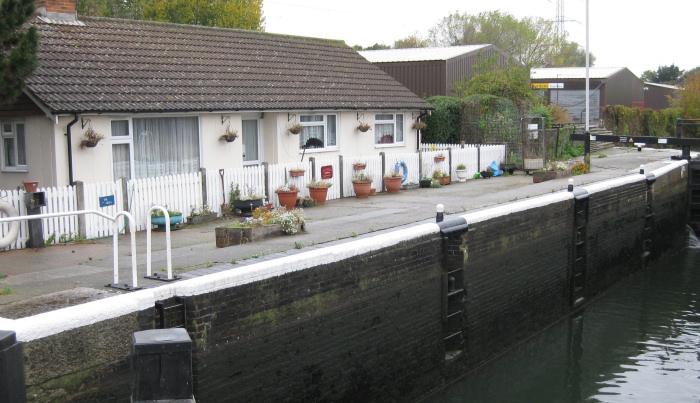 In the Waterways World issue of September 2015, it was reported that "....the lock has been renamed in honour of the long-time former lock keeper's ... 86th birthday, following a request from his family and the local boating community." 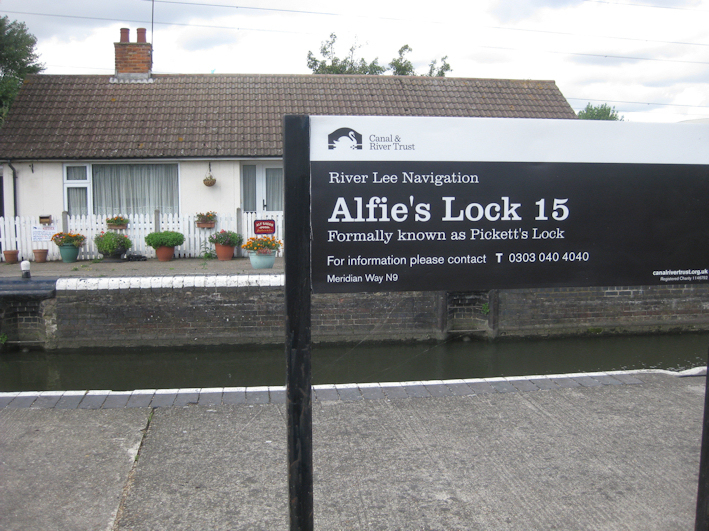 However, the renaming only lasted for a month and Alfie's Lock reverted to Picketts Lock in September 2015. "Formally" and "Formerly" are strangely both correct! 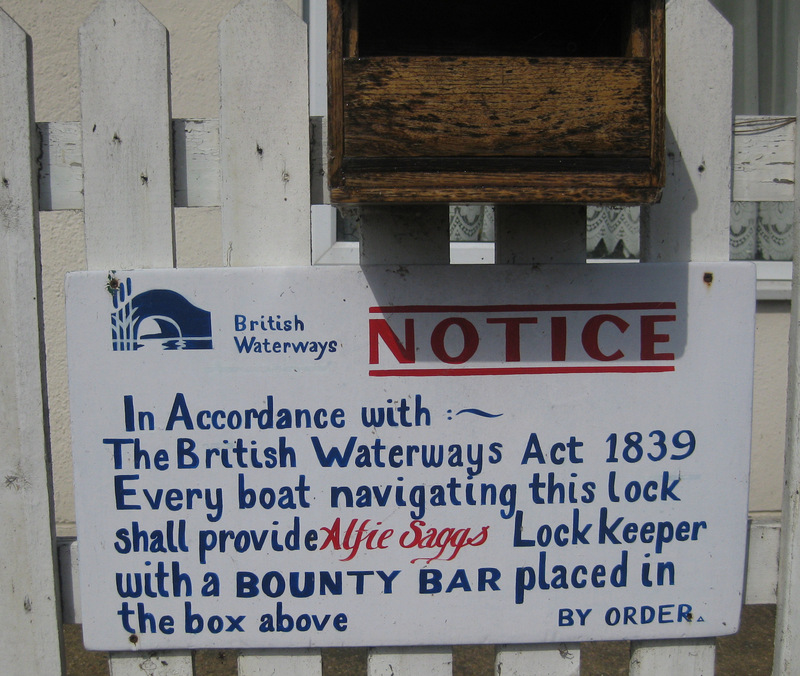 This hand-painted notice was placed beside the lock some years ago. Appointed, former Master Bargeman in Government employ.